Since we took over, we held a 4.5 dot rating out of 5 with Trip Advisor and a 9.3 rating out of 10 with Booking.com, as voted for by our guests. Since we arrived, we have undertaken a fair bit of improvements and refurbishments, among which tidying the front garden and creating outside seating for our guests to enjoy the sunshine, refurbishing the breakfast room and upgrading all our bathrooms. Location Location Location so they say for the Perfect Home, well we are perfectly located within the Coastal Resort of Clacton, just yards away from the Award Winning Sea Front Cliff top Gardens (Green Flag) and Award Winning Beaches (Blue Flag for West Beach). We are but a two minute walk to Pier Avenue and its entertainment area with all that it has to offer,plus The Pier with lots of new amusements including the new 6 lane 10 pin bowling alley. But out of reach from its noise. Turn left from our front garden and you are a three minute walk to Clacton town centre. The Pavilion has invested in new rides for all ages,and now also has a bowling alley with bar and restaurant over looking the sea and pier. Apparently we are 34% drier than other parts of England and Wales as a whole, which makes the area of Clacton the driest region. Some of our rooms do have a part sea view, so book early. 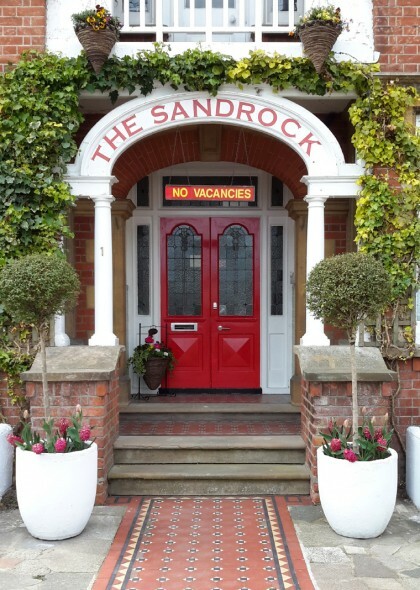 The Sandrock is a detached Victorian/Edwardian residents built of soft red bricks with sandstone piers and a red tiled roof. The property was sympathetically converted to a Hotel in 1973. There is a wide central staircase with two handrails to the first floor. We have one ground floor twin bedded room; on the middle floor, we have a Standard Double Room. On the first floor, 2 Deluxe Double rooms and 2 Twin rooms. On the top floor 2 Standard Double Rooms and 1 Deluxe Room. We have a travel cot that can be used within our more spacious rooms, ie the Deluxe Double rooms. There is a set of three pictures of all of our rooms on our website for you to view (click rooms at the top of this page) our rooms are serviced every day during your stay. You can rest easy knowing that our deserved reputation for cleanliness and our hospitality will afford you a comfortable stay. You will be sure of a warm welcome and a personal service from Christine & Roberto with The Sandrock staff. Our position is ideal for you to be able to roam around the shopping centre, the pier or the south facing sandy beaches but still only be a few minutes walk from The Sandrock. We are the closest Guest House to the Gardens (Green Award 2018) and West Cliff Beach (Blue Flag Award 2018). As mentioned we record some of the Sunniest and Driest Weather in England, so if you are thinking of touring our part of the country then Clacton will make an ideal base to stay with its evening entertainment pubs theatres and restaurants and of course The Pier. 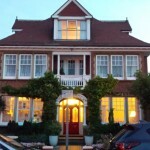 We are just a short distance from the Historic Town of Colchester, the Scenic area of The Dedham Vale 17 miles(Constable Country) Beth Chatto’s Famous Gardens to name but a few things to do while staying at the Seaside resort of Clacton-on-Sea. Our free Car Park is at the rear and free road side parking outside The Sandrock, our car park is first come first served. Free BT Infinity Wireless Broadband to every room for your laptops/ipads. Each room has a folder with a list of recommended places to eat, places to visit and general local information. To view our rooms on line, click on rooms at the head of the homepage and scroll down the room page. Post code : CO15 1JN, Grid Ref TM 174 145. From Clacton Town Centre, follow the signs for The Seafront, turn right at the Seafront on follow Marine Parade, drive past the traffic lights by The Pier, over a mini roundabout then first right into Penfold Road. We are the first house on your left in Penfold Road. Make the most of our website with it’s information section. Thank you and maybe we’ll meet during the Summer, Christine & Roberto.